iPad to Computer Transfer Mac - transfer iPad to Mac and Mac iPad Transfer software. Mac iPad Transfer, copy music and video from iPad to Mac. 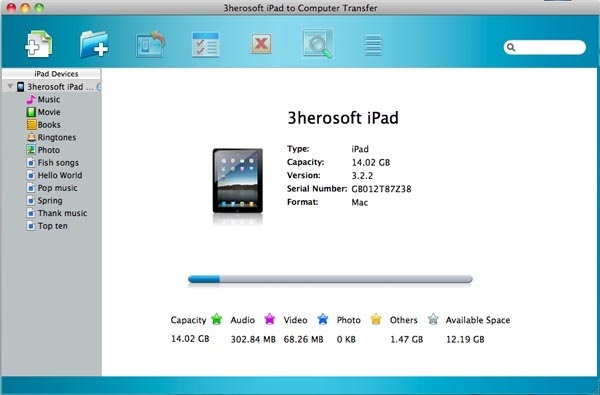 3herosoft iPad to Computer Transfer for Mac offers Apple iPad users a perfect solution for iPad files transferring, it allows you to easily transfer Music, Movie, Photo, ePub, PDF, Ringtone, Audiobook, Podcast and TV Show from iPad to Mac, and sync these files to iTunes library. Moreover, you can transfer music, video, photo, ePub, PDF to iPad library (iOS 5.0 or above) and also transfer purchased songs, video, podcast, iTunes U, books from iPad store to iTunes (support iTunes 12) or backup them on Mac local directly. Use iPad as a portable device and open iPad files on Mac hard disc , easily move, copy, delete, create any files/folders as your own. Also you can browse file information, organize playlist and digital collection in iPad, such as create new playlist, delete music and rename files. And this iPad to Mac transfer supports iPad, iPad 2, the new iPad, iPad 4, iPad mini. The Mac iPad transfer will works well on iOS 8 and iTunes 12. Transfer music, movie, photo, ePub, pdf, audiobook, Podcast and TV Show from iPad to Mac for backup. Transfer iPhone Ringtone, SMS, Contact, Call List from iPhone to Mac for backup. Easily transfer music, movie, Podcast and TV Show from Mac to iPad without using iTunes, much easier than iTunes! This iPad to Mac Transfer can copy/rip/put music and video files from iPad to iTunes library in a quick way. Support all types of iPad/iPod/iPhone including iPad, iPad 2, the new iPad, iPad 4, iPad mini, iPod classic, iPod shuffle, iPod mini, iPod touch, iPod touch 4, iPod nano, iPod nano 5G, iPod nano 6G, iPhone 3, iPhone 4, iPhone 5, iPhone 5S/5C, iPhone 6/6 Plus. You can open your iPad, iPhone or iPod touch with Finder like an external hard drive. With Filter and Quick Search options you can find and select music, videos, photos files you want as quickly as possible, the same function as iTunes does. After connecting iPad/iPhone/iPod to Mac, the interface of the software will display the device info including type, capacity (used and available space), version, serial number, and format. File transfer between iPad, iTunes and Mac with this iPad to Computer Transfer for Mac can be finished rapidly, not to worry about your computer slowing down or conflicting with other running programs. How to transfer photos from iPad to Mac for backup? How to transfer files from iPad to Mac, iPad files to Mac? Take photo shots with HD iPad 2 (new iPad0 and export camera roll to Mac desktop. How to sync the purchases files from iPad to iTunes library? How to transfer iPad music/videos to iPad 2 on Mac? Get iOS 5.0 or above for your iPad, and transfer photo/ePub/PDF to iPad (iPad 2, iPad 3) library. How to use iPad as as hard drive on Mac computer?